This month, we feature People’s Law School, a Clicklaw contributor and early Clicklaw Wikibooks adopter. PLS launched a new website yesterday at peopleslawschool.ca. Work (additional content to come in the months after launch). The new website focuses on clean, visual and interactive design, with practical tools such as template letters and document builders, that people can use to take steps to address their problem. 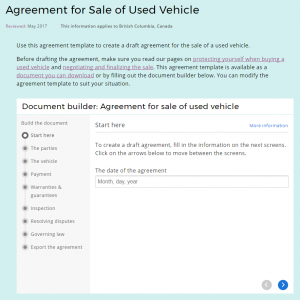 For example, they provide a document builder so you can draft your own agreement when selling a used car (See Image 1). You can provide feedback on the beta site here. In addition to providing linkages to their resources on Clicklaw, PLS continues to be a big contributor to the Wikibooks. PLS is committed to delivering information digitally, in addition to their in-person services and print publications. The Justice Theatre program stages interactive theatre performances in classrooms and community settings around the province, featuring legal issues relevant to the everyday lives of students and those with unique legal needs. In the months ahead, PLS will be working to develop curriculum resources for teachers to use before and after the Justice Theatre comes for their performance visits, working to have a more seamless integration with learning happening in the classroom. PLS will be developing a program to deliver classes online, zeroing in on their focus areas listed above, along with newer topics such as neighbour law. They will continue providing their in-person Learn @ Lunch sessions, as well as evening classes across the province with partnering community organizations and public libraries. There are many ways to contribute as a volunteer with People’s Law School – you can also sign up for their newsletter at the footer of their new site. Thank you to Patricia Byrne, Executive Director, and Drew Jackson, Legal Content Developer, for providing the information for this post. People’s Law School would like to thank the Law Foundation of BC for their support in building the new website.